Flaxby Park News - Respected architect Michael Wildblood MBE makes the case for Flaxby. I am regularly questioned by people who know that I have been involved in the master planning of the Flaxby new settlement proposals for the past two years as to why the Harrogate Council is preferring the Hammerton option. I have to reply that I honestly do not know. I suggest that it could be because Hammerton has existing railway stations, but surely the Flaxby proposal to build a new 350 car parkway station within the site where the A59 crosses the Harrogate to York railway at the developers expense (£8.4m budgeted), agreed as being technically achievable by Network Rail, is a more than adequate rebuttal of that assumption. It might also be because a new settlement is seen as a necessary evil and some councillors want it to be as far away from Harrogate and Knaresborough as possible. It should be no such thing if well designed. It has been suggested to me by some that it is down to the North Yorkshire County Council standing to gain tens of millions of pounds should part of the Hammerton site be developed for housing. This is not a planning reason and it is likely that if this is the reason it will be fully exposed at the local plan public inquiry that is due to be programmed for early next year. But whilst I and colleagues have been developing the proposals for Flaxby over the past two years and responding to the constructive criticism that has arisen from the outline planning application (17/05234/EIAMAJ) that was submitted at the end of last year, I have become more and more convinced that the planning case for Flaxby is overwhelming. The Harrogate District Chamber of Commerce has to be applauded for bringing the competing developers together at its June 2018 meeting, each to make a 15 minute presentation and to answer questions, to allow at least the local business community to make up its mind as to the preferred location. The Council has organised no such event and it is that omission that has prompted me to write this open letter to you, the Cabinet Member for Planning, so that the wider community can have a greater understanding. Flaxby, a New Settlement for Harrogate and Knaresborough, not York. There is no doubt that the A1(M) is a psychological barrier dividing Harrogate/Knaresborough from York. This is reinforced by Flaxby on the west side of the motorway having an ‘HG’ postcode, Hammerton on the east, ‘YO’. When Richard Raper was introduced to the Hammertons’ community as the ‘Keep Hammertons Green’ planning consultant on 29th January 2018, his first question was to ask residents where they shopped, Harrogate or York. All but a very small handful raised their hands to answer ‘York’. How likely it would be that new residents would vote in a similar way! The absence of another smaller town en-route (Knaresborough) and the existence of an efficient park and ride at Poppleton make York feel so much closer than its measured equi-distant mileage would have you think. In a phone call to the Harrogate Housing Department in early June I asked how helpful affordable homes in the new settlement would be to help fulfil the District’s housing needs. The reaction I received was that in this respect Flaxby would be a much more preferable location than Hammerton, as the latter is more remote from the main area of need. If a park and ride (rail) parkway station is considered to be an appropriate component to reduce the traffic on the A59, and so it should be, how much more attractive-to-use it would be if it were located close to the A1(M) and on its west side. Who would drive 4km to the east to take a train west to Harrogate or Knaresborough? Therefore in terms of helping the Harrogate and Knaresborough local economies, providing more suitably located affordable homes for the District and reducing traffic on the A59, a new settlement on the west side of the A1(M) has to be a much better option than one to the east. Flaxby, a New Settlement that builds on what is there or proposed already. The grant of planning permission in September 2017 for Flaxby Green Park, the 17 hectare, 550,000 sq ft, 2840 employee strategic business park next to the proposed Flaxby new settlement site was in my mind a ’game changer’. How much more sensible it would now be to build new homes next to the jobs rather than 4km away towards York along the busy A59. The sustainable development synergies and benefits are substantial. As soon as this planning permission was granted, a bridleway standard bridge across the A59 was incorporated into the Flaxby proposals to enable residents to walk or cycle to work rather than be forced to travel to work by car. The proposals for the Green Park include land to be made available for a new railway station (next to the former Donnelly Printworks). This would not be needed if the Flaxby new settlement proposals were implemented and the parkway station built. A very regular ‘hopper’ bus service is proposed around the new settlement to connect its homes and facilities with the Green Park and the rail station. Homes and jobs at Flaxby would provide both the ‘start’ and ‘destination’ of journeys, both in the morning and afternoon rush hours, a very attractive proposition for Northern, the rail service operator. In addition, Transdev, the bus operator, has already indicated that it would consider favourably an extension of the 1A bus service that currently serves Harrogate, Knaresborough and the St James Business Park out to the proposed new homes and jobs at Flaxby. Transdev tell us that an extension of that route to Hammerton would be far too long to be practicable. Flaxby would be very well connected with public transport. A second sound reason for Flaxby is its relatively close proximity to the incinerator at the Allerton Waste Recovery Park, which commenced operation in mid-2017, and the scope that this offers for cheaper energy to heat both a new settlement at Flaxby and the approved Flaxby Green Park employment site. The peak demand for the two developments is calculated to be between 18-23 MWth, well within the capacity of the incinerator’s waste heat that is currently discharged into the atmosphere. Furthermore, if the two mains heating pipes are thrust bored under the motorway at a point alongside the incinerator to the opposite western side, they could emerge on land owned by one of the parties to the Flaxby outline planning application. This land extends more than the 500 metres over the ridge up to that point from the proposed new settlement site. No third party private land would be required for the laying of the pipes and, other than the crossing of the A1(M), their route would be entirely within ‘the soft’, that is, undeveloped land. Under the terms of the permit and the planning permission, Amey, the operator of the incinerator, is obliged to find an outlet for its waste heat and to report to the North Yorkshire County Council on its attempts every two years. Development at Flaxby could fulfil the objectives of that requirement and in so doing could significantly boost the green credentials of both the Harrogate and the North Yorkshire County Councils. Furthermore the operation of a district heating scheme, fuelled by the incinerator, would provide ongoing income for the County Council, Amey’s partner in the operation of the Allerton plant. The Flaxby new settlement, unlike its Hammerton counterparts, has been the location of significant previous development. Gravel was extracted from it prior to the construction of the motorway and it served as the road-builder’s compound during the A1(M)’s construction. The golf course, subsequently laid out over two thirds of the Flaxby site, included club house, players’ car park, green keepers’ and pump house buildings and numerous man-made structures, all of which have remained in place. Furthermore the Harrogate Borough Council granted planning permission for a 5 storey 300 bedroom hotel in 2013 which was started prior to its promoters, the Skelwith Group, going into liquidation. The £4m roundabout, built on the A59 for that development, provides a ready-made point of access into the proposed new settlement. No A59 or other main road by-pass or diversion will be required. Flaxby goes a significant way to satisfying a requirement of the new National Planning Policy Framework, which at paragraph 117 states that in its policies and decisions, local planning authorities should meet housing need making as much uses as possible of previously developed land. Furthermore, the Flaxby proposals (covering a site area of 174 hectares) would only take 22 hectares out of agricultural production for the built development. The landform for the Flaxby site is a ‘bowl’. The natural lie of the land rises to the northern and western boundaries and man-made mounding has been introduced to much of the other two, which adjoin the A1(M) and the A59. The proposals contained in the current planning application include for gaps in the man-made mounding to be filled, particularly where they are needed around the former driving range next to Junction 47. Much of this higher ground is supplanted by trees. This too will be added to in order for the site to be screened from the vast majority of views into and over it from the surrounding roads, footpaths and countryside. The planning application proposes just over 50ha of woodland in total, providing significant benefits not only for the enjoyment of the site, but also for wildlife. Not all of this woodland is to be around the perimeter. In addition to Flaxby Covert towards the south of the site, there are numerous copses of mature trees and areas of new planting within it that were planted to separate the former golf holes. All of these, the 21 ponds and the streams on the site, can be used as a basis for an extremely well landscaped development. The proposed linear park that runs from north to south through the centre of the site, and the branches that stem from it to the perimeter could set a framework for a truly delightful place for people to live. The Flaxby site also benefits from having Allerton Park, a Grade II Registered Park and Garden, Allerton Castle and The Temple of Victory located close to it on the far (east) side of the A1 motorway and the parallel A168 access road. Allerton Castle, built to a design by George Martin between 1848 and 1851, replacing an earlier stately home, is Grade I listed. The Temple, built as a summer house for the earlier building between 1786 and 1789, possibly to a design by James Paine or William Kent, is Grade II*. There is extensive screening between these heritage assets and the Flaxby site, but it is not complete. Great care has been taken in the preparation of the design for the new settlement on the one hand to add to the screening to minimise views of the new housing from The Temple, but on the other, to provide small gaps in it so that vistas can be had of both The Temple and the roofscape of The Castle from a few key vantage points. These will be from the main access route, from the proposed central square and from the old York Road, which crosses the site and became a cul-de-sac when the motorway was built in the 1990s. There is very little public access to The Temple and The Castle at present other than for weddings or other booked events. We believe that the approach we are taking for selective viewing will increase the public’s enjoyment of them and it will root the proposed new settlement in a key part of the locality’s history. Working with Historic England, the design team has developed additional features that will include a heritage walk, a viewing platform with interpretation boards and locations for new artwork, not only to respect past heritage, but also to add to it for future generations. There is a further way in which the site, being on the west side and close to Junction 47 of the A1(M), could bring additional benefits to the District beyond providing more useful affordable housing, a park and ride facility and revenue and green credentials from an incinerator-linked district heating scheme. 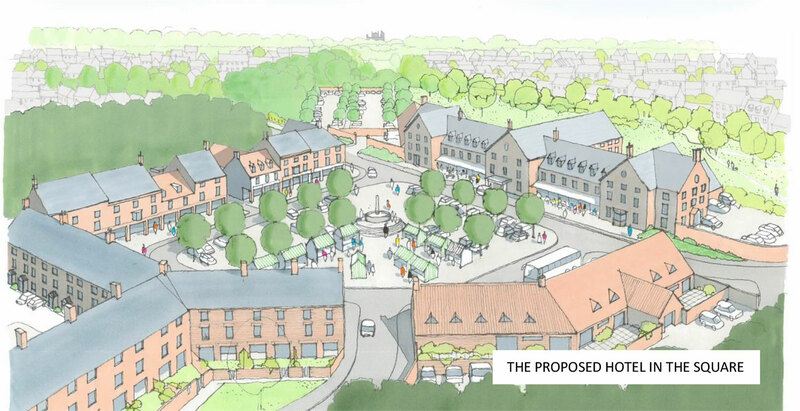 Following guidance in the National Planning Policy Framework for new developments to demonstrate local distinctiveness in their appearance, we believe that the Flaxby new settlement should include a typical North Yorkshire central market square. Furthermore a good quality hotel in that square would almost certainly be viable thanks to trade from travellers on the A1(M), business visitors to Flaxby Green Park and even guests for Allerton Castle weddings. This could also benefit Harrogate and Knaresborough and their many attractions, including the Harrogate Conference Centre, by providing high quality hotel bed-spaces at their eastern gateway. This narrative has focussed on what the two locations, Flaxby and Hammerton, have to offer. I fully accept that both could potentially support the improvement of local road junctions and provide well designed buildings, infrastructure and facilities. Flaxby Park Ltd., the promoters of the proposed new settlement at Flaxby, already control their site through ownership or options. The site already benefits from mains services for a first phase of housing to be constructed and none of the gas, electricity and water mains required for the complete development has to be brought in from any distance. No re-routeing of the A59 is required and only relatively short lengths will need to be upgraded. These are not the case for Hammerton. The boundary there has yet to be decided. Is it to be the site of one of the competing developers, the site of the other or a hybrid of the two? No-one yet knows; the publication draft of the emerging Harrogate Local Plan only commits to ‘somewhere in the Hammerton/Cattal/Whixley general area’. Both developers of the overlapping sites are opposing the site of the other through the local plan process and no doubt the exercise will be repeated when both of their planning applications have been submitted. What does this say about the collective ability to deliver a new settlement? Paragraph 52 of the National Planning Policy Framework suggests that the supply of new homes can sometimes best be achieved through the planning of larger scale developments. It goes on to say that local planning authorities should consider this “working with the support of the communities”. From the evidence of the responses to the drafts of the emerging local plan and the green protest signs that flank the A59 and the B6265 there is little evidence of this. I am aware that the inspector will consider all of the arguments that I have put forward above, and others, when the local plan is examined in public whenever that may be. However, in light of what I have said in this letter and the many objections put forward in response to the publication draft of the local plan earlier in the year, I respectfully request that The Council reconsiders its preference for as yet an undefined site for the new settlement somewhere in the Hammerton/Whixley/Cattal general area. Its current preference does not seem to flow from the evidence. (Michael Wildblood is a consultant to Wildblood Macdonald, Architects, who were appointed to provide architectural and master-planning services to Flaxby Park Ltd in 2016. He has lived and worked within 6 miles of all of the proposed new settlement sites for the past 30 years. The opinions expressed in this letter are his personal opinions).